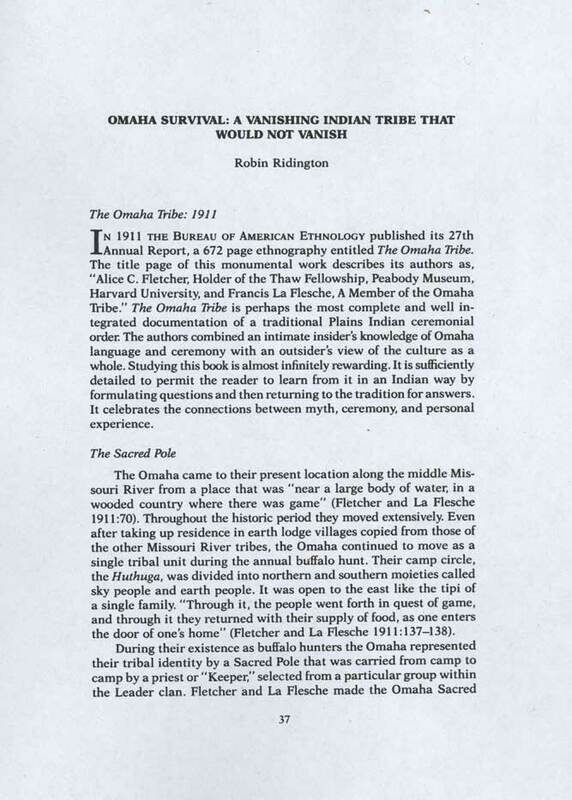 IN 1911 THE BUREAU OF AMERICAN ETHNOLOGY published its 27th Annual Report, a 672 page ethnography entitled The Omaha Tribe. The title page of this monumental work describes its authors as, "Alice C. Fletcher, Holder of the Thaw Fellowship, Peabody Museum, Harvard University, and Francis La Flesche, A Member of the Omaha Tribe." The Omaha Tribe is perhaps the most complete and well integrated documentation of a traditional Plains Indian ceremonial order. The authors combined an intimate insider's knowledge of Omaha language and ceremony with an outsider's view of the culture as a whole. Studying this book is almost infinitely rewarding. It is sufficiently detailed to permit the reader to learn from it in an Indian way by formulating questions and then returning to the tradition for answers. It celebrates the connections between myth, ceremony, and personal experience. The Omaha came to their present location along the middle Missouri River from a place that was "near a large body of water, in a wooded country where there was game" (Fletcher and La Flesche 1911:70). Throughout the historic period they moved extensively. Even after taking up residence in earth lodge villages copied from those of the other Missouri River tribes, the Omaha continued to move as a single tribal unit during the annual buffalo hunt. Their camp circle, the Huthuga, was divided into northern and southern moieties called sky people and earth people. It was open to the east like the tipi of a single family. "Through it, the people went forth in quest of game, and through it they returned with their supply of food, as one enters the door of one's home" (Fletcher and La Flesche 1911:137-138). Pole and its ceremonial traditions the centerpiece of their book. 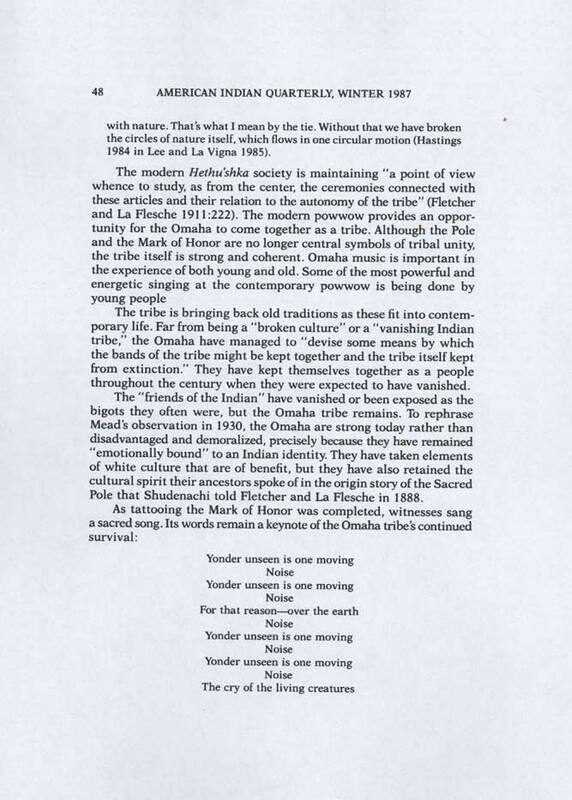 The Sacred Pole, like the Huthuga, represented the essence of Omaha identity. When the buffalo disappeared and the Omaha were forced to settle on a reservation, both the Pole and the Huthuga became inappropriate symbols of tribal unity. The Omaha turned away from the Pole, but not from the sense of a common identity it symbolized. They thought it best to allow the Pole to be buried with its last Keeper, the great orator named Shudenachi (Smoked Yellow). 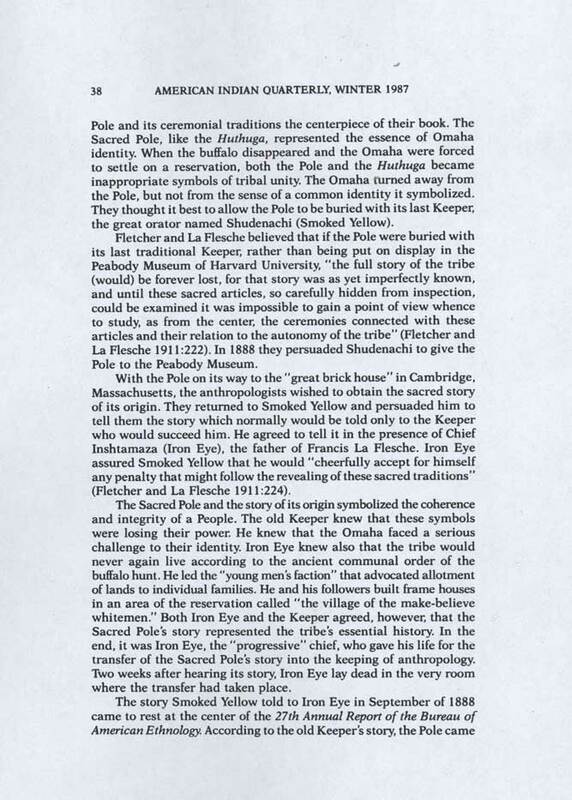 Fletcher and La Flesche believed that if the Pole were buried with its last traditional Keeper, rather than being put on display in the Peabody Museum of Harvard University, "the full story of the tribe (would) be forever lost, for that story was as yet imperfectly known, and until these sacred articles, so carefully hidden from inspection, could be examined it was impossible to gain a point of view whence to study, as from the center, the ceremonies connected with these articles and their relation to the autonomy of the tribe" (Fletcher and La Flesche 1911:222). In 1888 they persuaded Shudenachi to give the Pole to the Peabody Museum. With the Pole on its way to the "great brick house" in Cambridge, Massachusetts, the anthropologists wished to obtain the sacred story of its origin. They returned to Smoked Yellow and persuaded him to tell them the story which normally would be told only to the Keeper who would succeed him. He agreed to tell it in the presence of Chief Inshtamaza (Iron Eye), the father of Francis La Flesche. Iron Eye assured Smoked Yellow that he would "cheerfully accept for himself any penalty that might follow the revealing of these sacred traditions" (Fletcher and La Flesche 1911:224). The Sacred Pole and the story of its origin symbolized the coherence and integrity of a People. The old Keeper knew that these symbols were losing their power. He knew that the Omaha faced a serious challenge to their identity. Iron Eye knew also that the tribe would never again live according to the ancient communal order of the buffalo hunt. He led the "young men's faction" that advocated allotment of lands to individual families. He and his followers built frame houses in an area of the reservation called "the village of the make-believe whitemen." Both Iron Eye and the Keeper agreed, however, that the Sacred Pole's story represented the tribe's essential history. In the end, it was Iron Eye, the "progressive" chief, who gave his life for the transfer of the Sacred Pole's story into the keeping of anthropology. Two weeks after hearing its story, Iron Eye lay dead in the very room where the transfer had taken place. My son has seen a wonderful tree. The Thunder Birds come and go upon this tree, making a trail of fire that leaves four paths on the burnt grass that stretch toward the Four Winds. When the Thunder Birds alight upon the tree it bursts into flame and the fire mounts to the top. The tree stands burning, but no one can see the fire except at night. (Fletcher and La Flesche 1911:218). The Sacred Pole was taken from that tree. The Omaha People looked to the Pole as the symbolic center of their identity. It stood for a "point of view as from the center" around which their world turned. It passed out of Omaha life when it became an ethnological specimen in the Peabody Museum. As an ethnological specimen in a glass case, it came to represent the Omaha Tribe only to outsiders. The buffalo disappeared from Omaha life in the 1870s. Without the buffalo, the tribe was no longer able to renew the Pole in the annual or bi-annual world renewal ceremony called Waxthexe xigithe, "the Sacred Pole to tinge with red." 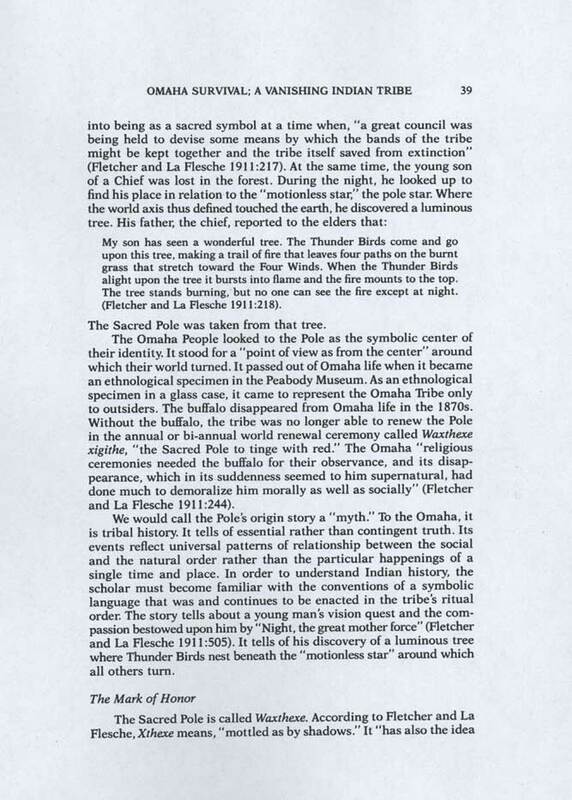 The Omaha "religious ceremonies needed the buffalo for their observance, and its disappearance, which in its suddenness seemed to him supernatural, had done much to demoralize him morally as well as socially" (Fletcher and La Flesche 1911:244). We would call the Pole's origin story a "myth." To the Omaha, it is tribal history. It tells of essential rather than contingent truth. Its events reflect universal patterns of relationship between the social and the natural order rather than the particular happenings of a single time and place. In order to understand Indian history, the scholar must become familiar with the conventions of a symbolic language that was and continues to be enacted in the tribe's ritual order. The story tells about a young man's vision quest and the compassion bestowed upon him by "Night, the great mother force" (Fletcher and La Flesche 1911:505). It tells of his discovery of a luminous tree where Thunder Birds nest beneath the "motionless star" around which all others turn. of bringing into prominence to be seen by all the people as something distinctive." The prefix Wa indicates that "the object spoken of had power, the power of motion, of life." Xthexe also refers to "the Mark of Honor" that was tattooed on the forehead and chest of a young woman whose father had joined the Hon 'hewachi or "Night Dance Society." Members of this society were an "Order of Chiefs" who had gained honor by contributing one hundred acts or gifts, "which have relation to the welfare of the tribe." The girl who received the tattooing became known as a "woman chief." Fletcher and La Flesche say that, "The name of the Pole, Waxthexe, signifies that the power to give the right to possess this 'Mark of Honor' was vested on the Pole.... The designs tattooed on the girl were all cosmic symbols" (Fletcher and La Flesche 1911:219). The mark on the young woman's forehead symbolized the sun at its zenith, "from which point it speaks," and its life-giving power passes through her body and out into the camp circle. The mark on her chest was a four-pointed star radiating from a perfect circle. According to Fletcher and La Flesche, the sun-sign stood for "the noise of teeming life moving over the earth." The star represented night, "the great mother force." The young woman received the mark on a bed flanked with 100 knives and 100 awls driven into the ground on either side of the morning fire. These tools were said to represent the union of work done by men and women. The servers of the ceremony pricked the tattoo's pigment into her skin with flint points bound to rattlesnake rattles. 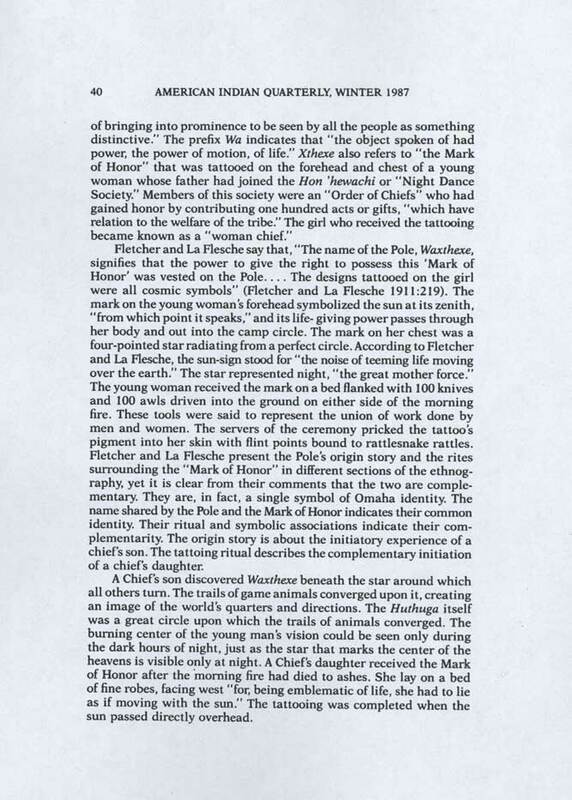 Fletcher and La Flesche present the Pole's origin story and the rites surrounding the "Mark of Honor" in different sections of the ethnography, yet it is clear from their comments that the two are complementary. They are, in fact, a single symbol of Omaha identity. The name shared by the Pole and the Mark of Honor indicates their common identity. Their ritual and symbolic associations indicate their complementarity. The origin story is about the initiatory experience of a chief's son. The tattoing ritual describes the complementary initiation of a chief's daughter. A Chief's son discovered Waxthexe beneath the star around which all others turn. The trails of game animals converged upon it, creating an image of the world's quarters and directions. The Huthuga itself was a great circle upon which the trails of animals converged. The burning center of the young man's vision could be seen only during the dark hours of night, just as the star that marks the center of the heavens is visible only at night. A Chief's daughter received the Mark of Honor after the morning fire had died to ashes. She lay on a bed of fine robes, facing west "for, being emblematic of life, she had to lie as if moving with the sun." The tattooing was completed when the sun passed directly overhead. 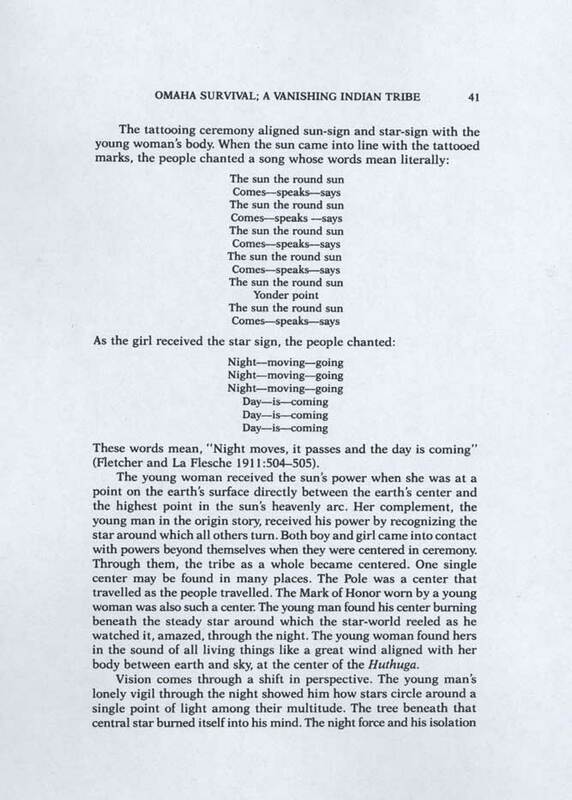 These words mean, "Night moves, it passes and the day is coming" (Fletcher and La Flesche 1911:504-505). The young woman received the sun's power when she was at a point on the earth's surface directly between the earth's center and the highest point in the sun's heavenly arc. Her complement, the young man in the origin story, received his power by recognizing the star around which all others turn. Both boy and girl came into contact with powers beyond themselves when they were centered in ceremony. Through them, the tribe as a whole became centered. One single center may be found in many places. The Pole was a center that travelled as the people travelled. The Mark of Honor worn by a young woman was also such a center. The young man found his center burning beneath the steady star around which the star-world reeled as he watched it, amazed, through the night. The young woman found hers in the sound of all living things like a great wind aligned with her body between earth and sky, at the center of the Huthuga. revealed this sky-world to him. "The whole tree, its trunk, branches, and leaves, were alight, yet remained unconsumed" But by day, "the brightness of the tree began to fade, until with the rising of the sun the tree with its foliage resumed its natural appearance" (Fletcher and La Flesche 1911:217). Now and again [the Indian] tricks himself out in the old time finery, wearing as ornaments the decorations that a generation ago could have been worn only by the man who had won them by valor and the approval of the gods. He dances with a light heart and dramatic He-dhu-ska, which was a vivid and picturesque representation of historical incidents. All these young men who were here so fine, are hard working farmers. The dance is their recreation, and while the religious and historic significance has been nearly lost, there is still a lingering charm in the brilliant colors, the stirring song, and rhythmic precision of movement (Fletcher ms. National Anthropological Archives 4558-Box 19-Item 65- 2). Alice Fletcher belonged to a movement generally referred to as the "friends of the Indian." During the late nineteenth and early twentieth centuries, North American governments based their decisions about Indian policy on a conviction that Indian cultures must inevitably give way to what they believed were the more "advanced" and "civilized" cultures derived from Europe. Christian humanitarian and philanthropic groups dedicated to Americanizing the Indians and furthering their progress from "savagery" to "civilization" became active in Boston and Philadelphia during the last quarter of the nineteenth century (Prucha (1976:132–168; 1984:611-658). The ethnocentric and self-righteous men and women of these organizations, "resolved to do away with Indianness and to preserve only the manhood of the individual Indian" (Prucha 1973:1). They called themselves "the friends of the Indian," but their friendship more often patronized than under-stood or accepted Indian reality as being more than a colorful legacy of the past. "made to feel that the United States, and not some paltry reservation, is their home . . . training should be saturated with moral ideas which break the shackles of his tribal provincialism [and] render the life of the camp intolerable to them" (Otis 1973:72-74). Morgan also pronounced the harsher judgment that, "This civilization may not be the best possible, but it is the best the Indians can get. They cannot escape it, and must either conform to it or be crushed by it" (Prucha 1973:1). The reform movement that led to the "friends of the Indian" became organized following a lecture tour of the east in 1879 by Chief Standing Bear of the Poncas and a missionary, Thomas Henry Tibbles. The Poncas, close relatives of the Omaha, had been removed forcibly and with great suffering from their home in Nebraska to "Indian Territory." Tibbles and Standing Bear were accompanied by a young Omaha woman, Bright Eyes (Susette) La Flesche, and her half brother, Francis La Flesche. Among the reformers who attended talks given by Standing Bear, Tibbles, Bright Eyes, and Francis La Flesche were Senator Henry L. Dawes of Massachusetts, and Alice Cunningham Fletcher of Boston. Dawes and Fletcher believed in the righteousness of assimilationist objectives. Their efforts and those of the other re-formers resulted in legislation known as The General Allotment Law (The Dawes Act) of 1887, "an Act to provide for the allotment of lands in severalty to Indians on the various reservations, and to extend the protection of the laws of the United States and the Territories over the Indians, and for other purposes" (Otis 1973:177). This act, like the prohibitionist constitutional amendment of a few decades later, was a "noble experiment" that resulted in dismal failure. At best, it invited abuse and exploitation of the people it was supposed to benefit. At worst, it fundamentally denied the reality of Indian cultural identity. In theory, The Dawes Act was supposed to instill in Indians the virtue of individual responsibility that was thought to accompany private ownership of property, but more often it exposed many of them to exploitation by unscrupulous land grabbers. In the opinion of D. S. Otis, author of a report on the Dawes Act at the beginning of John Collier's administration as Commissioner of Indian Affairs in 1932, "While the young were being educated, their parents' farms disintegrated. The graduates left the schools with educations that had shattered their traditions and substituted little that was real, and they returned home in quest of the 'main chance' to find a demoralized community" (Otis 1973:80). Fletcher died in 1923. Francis La Flesche retired to Macy, Nebraska in 1929 and died there in 1932 (Alexander 1933). 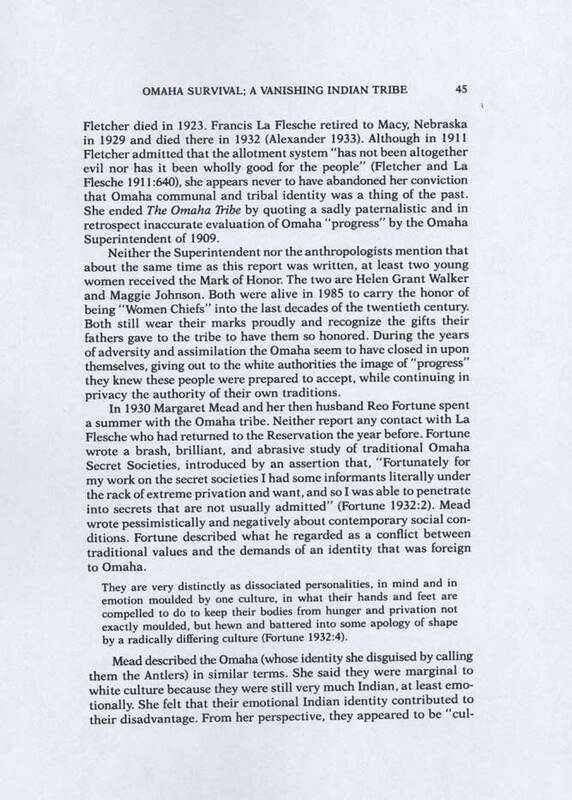 Although in 1911 Fletcher admitted that the allotment system "has not been altogether evil nor has it been wholly good for the people" (Fletcher and La Flesche 1911:640), she appears never to have abandoned her conviction that Omaha communal and tribal identity was a thing of the past. She ended The Omaha Tribe by quoting a sadly paternalistic and in retrospect inaccurate evaluation of Omaha "progress" by the Omaha Superintendent of 1909. Neither the Superintendent nor the anthropologists mention that about the same time as this report was written, at least two young women received the Mark of Honor. The two are Helen Grant Walker and Maggie Johnson. Both were alive in 1985 to carry the honor of being "Women Chiefs" into the last decades of the twentieth century. Both still wear their marks proudly and recognize the gifts their fathers gave to the tribe to have them so honored. During the years of adversity and assimilation the Omaha seem to have closed in upon themselves, giving out to the white authorities the image of "progress" they knew these people were prepared to accept, while continuing in privacy the authority of their own traditions. In 1930 Margaret Mead and her then husband Reo Fortune spent a summer with the Omaha tribe. Neither report any contact with La Flesche who had returned to the Reservation the year before. Fortune wrote a brash, brilliant, and abrasive study of traditional Omaha Secret Societies, introduced by an assertion that, "Fortunately for my work on the secret societies I had some informants literally under the rack of extreme privation and want, and so I was able to penetrate into secrets that are not usually admitted" (Fortune 1932:2). Mead wrote pessimistically and negatively about contemporary social conditions. Fortune described what he regarded as a conflict between traditional values and the demands of an identity that was foreign to Omaha. They are very distinctly as dissociated personalities, in mind and in emotion moulded by one culture, in what their hands and feet are compelled to do to keep their bodies from hunger and privation not exactly moulded, but hewn and battered into some apology of shape by a radically differing culture (Fortune 1932:4). Those individual Indians who have been able to seize some opportunity to enter the majority culture—who have obtained an adequate education and have made a career in the modern world—succeed as other Americans do, on an individual basis. But others remain tied through their self-definition to a childhood way of life that binds them to the reservation. And still others retreat before outsiders' definitions of them as alien in race and, therefore, alien as human beings. Where by definition Indians are set apart and exist, in their relations to the world, not as individuals but as an undifferentiated group, they do not share in modern American culture. Emotionally bound to an archaic identity that has acquired racial associations, American Indians represent one of the major in-tractable groups among the culturally deprived (Mead 1965:xvi). For hours the music swirled around me, men and women danced, and I watched a game, every movement of which was utterly incomprehensible to me. That night I realized there was another world in Lincoln, Nebraska, a world that was utterly foreign to me, totally unknown, profoundly attractive. making, gift giving, and music—three pervasive characteristics of Omaha culture. The Old Ways, for many Omahas, hold a great many truths that should not be abandoned—a perception shared by many of us who are not Omaha by birth but nonetheless admire Omaha culture. Many traditionally oriented Omahas cling to the Old Ways not out of provincialism, ignorance, or stubbornness but because after due and deliberate consideration they seem the wisest course (Welsch in Lee and La Vigna 1985). with nature. That's what I mean by the tie. Without that we have broken the circles of nature itself, which flows in one circular motion (Hastings 1984 in Lee and La Vigna 1985). The modern Hethu'shka society is maintaining "a point of view whence to study, as from the center, the ceremonies connected with these articles and their relation to the autonomy of the tribe" (Fletcher and La Flesche 1911:222). The modern powwow provides an opportunity for the Omaha to come together as a tribe. Although the Pole and the Mark of Honor are no longer central symbols of tribal unity, the tribe itself is strong and coherent. Omaha music is important in the experience of both young and old. Some of the most powerful and energetic singing at the contemporary powwow is being done by young people. The tribe is bringing back old traditions as these fit into contemporary life. Far from being a "broken culture" or a "vanishing Indian tribe," the Omaha have managed to "devise some means by which the bands of the tribe might be kept together and the tribe itself kept from extinction." They have kept themselves together as a people throughout the century when they were expected to have vanished. The "friends of the Indian" have vanished or been exposed as the bigots they often were, but the Omaha tribe remains. 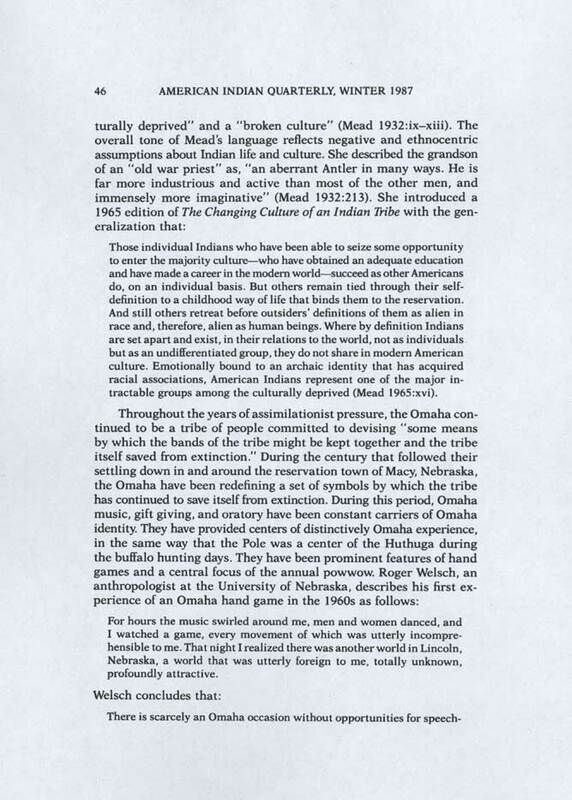 To rephrase Mead's observation in 1930, the Omaha are strong today rather than disadvantaged and demoralized, precisely because they have remained "emotionally bound" to an Indian identity. They have taken elements of white culture that are of benefit, but they have also retained the cultural spirit their ancestors spoke of in the origin story of the Sacred Pole that Shudenachi told Fletcher and La Flesche in 1888. 1984 Two Crows Denies It: A History of Controversy in Omaha Sociology. Lincoln: University of Nebraska Press. ms. When Is a People not a People: The Vanishing American Myth in Anthropological Writing. 1985. 1970 History of the Indians of the United States. Norman: University of Oklahoma Press. 1982 The Vanishing American: White Attitudes and U.S. Indian Policy. Middletown, Connecticut: Wesleyan University Press. 1884 Omaha Sociology. BAE 3rd Annual Report. Washington: Government Printing Office. 1890 The Cegiha Language. Contributions to North American Ethnology Vol 6. Washington: U.S. Geographical and Geological Survey of the Rocky Mountain Region. 1885 Lands in Severalty to Indians: Illustrated by Experiences with the Omaha Tribe. Proceedings of the American Association for the Advancement of Science 33:654—665. 1888 Glimpses of Child-life among the Omaha Tribe of Indians. Journal of American Folk-Lore 2:115—123. 1892 Hae-Thu-Ska Society of the Omaha Tribe. Journal of American Folk-Lore 5:135—144. 1893 A Study of Omaha Indian Music. Archaeological and Ethnological Papers of the Peabody Museum 1(5). 1894 Love Songs among the Omaha Indians. Memoirs of the International Congress of Anthropology. Staniland Wake, ed. 153-157. Chicago: The Schulte Publishing Company. ms. Glimpses of Omaha Life. (lecture notes) Washington: National Anthropological Archives 4558, Box 19, Item 65-2.
ms. 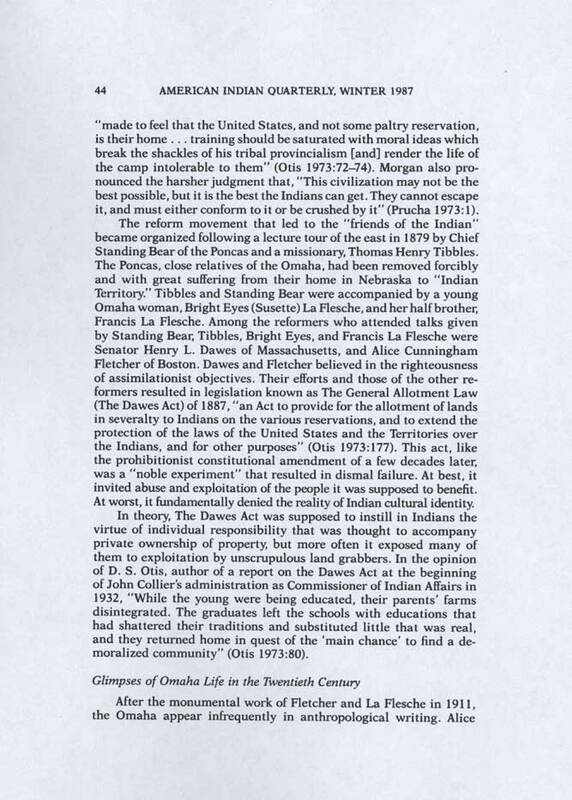 The Omaha Tribe with Special Reference to the Position, Work and Influence of Indian Women. (lecture notes) Washington: National Anthropological Archives 4558, Box 19, Item 65-3. 1911 The. Omaha Tribe. Washington: Bureau of American Ethnology 27th Annual Report. 1932 Omaha Secret Societies. New York: Columbia University Press. 1969 Iron Eye's Family: The Children of Joseph La Flesche. Lincoln: Johnson Publishing Co.
1963 The Middle Five: Indian Schoolboys of the Omaha Tribe. Madison: The University of Wisconsin Press. 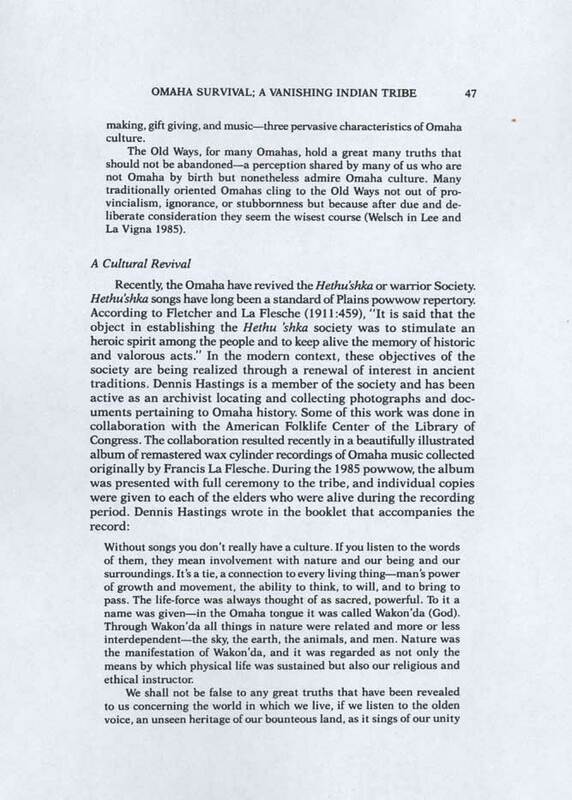 1985 Omaha Indian Music: Historical Recordings from the Fletcher/La Flesche Collection. Washington: American Folklife Center, Library of Congress. 1976 Native American "Informants": The Contribution of Francis La Flesche. pp. 99—110 in American Anthropology: The Early Years, ed. by John V. Murra. 1974 Proceedings of the American Ethnological Society. St. Paul: West Publishing Co.
1978 Francis La Flesche, Omaha, 1857—1932. Pp. 45—60 in American Indian Intellectuals, ed. by Margot Liberty. 1976 Proceedings of the American Ethnological Society. St. Paul: West Publishing Co.
1966 Women in Early American Anthropology. pp. 29—82 in Pioneers of American Anthropology: The Uses of Biography, ed. by June Helm. Seattle: University of Washington Press. 1980 Four Anthropologists: An American Science in its Early Years. New York: Science History Publications. 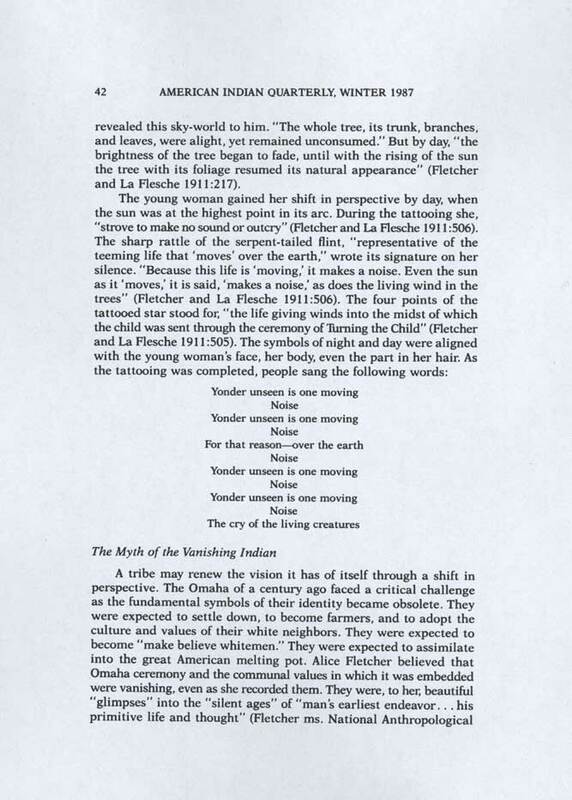 1982 Francis La Flesche: The American Indian as Anthropologist. Isis 73(269)495—510. 1973 Native American Tribalism: Indian Survivals and Renewals. New York: Oxford University Press. 1932 The Changing Culture of an Indian Tribe. New York: Columbia University Press. 1965 Consequences of Racial Guilt. Introduction to 2nd Edition of The Changing Culture of an Indian Tribe. 1973 The Dawes Act and the Allotment of Indian Lands. Norman: University of Oklahoma Press. 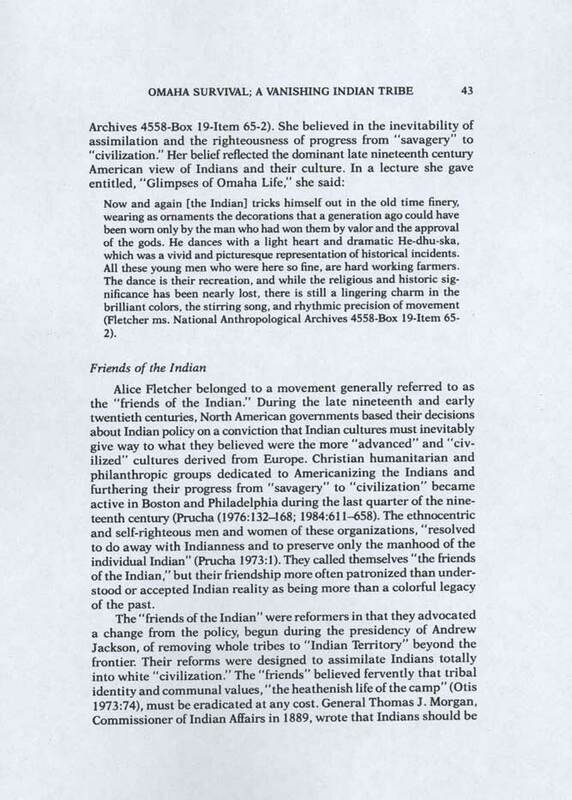 1973 Americanizing the American Indians: Writings by the "Friends of the Indian" 1880—1900. Cambridge: Harvard University Press. 1975 Documents of United States Indian Policy. Lincoln: University of Nebraska Press. 1976 American Indian Policy in Crisis: Christian Reformers and the Indian, 1865—1900. Norman: University of Oklahoma Press. 1979 The Churches and the Indian Schools, 1888—1912. Lincoln: University of Nebraska Press. 1981 Indian Policy in the United States: Historical Essays. Lincoln: University of Nebraska Press. 1982 Indian-White Relations in the United States. 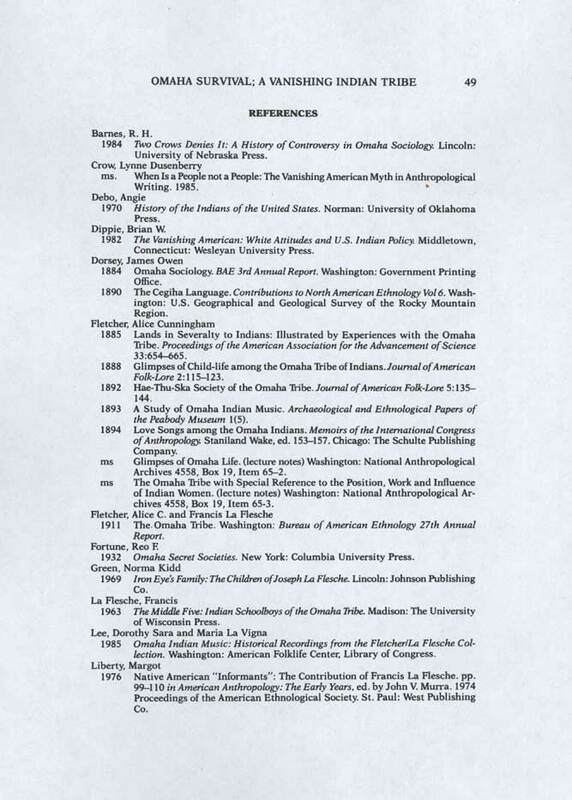 A Bibliography of Works Published 1975—1980. Lincoln: University of Nebraska Press. 1984 The Great Father: The United States Government and the American Indians. Lincoln: University of Nebraska Press. 1986 Mottled as by Shadows: A Sacred Symbol of the Omaha Tribe. in Voices of the First America: Text and Context in the New World. New Scholar. 1957 Buckskin and Blanket Days. Garden City: Doubleday. 1973 A History of Indian Policy. Washington: Bureau of Indian Affairs. 1966 Disinherited: The Lost Birthright of the American Indian. New York: William Morrow. 1981 Diplomats in Buckskins: A History of Indian Delegations in Washington City. Washington: Smithsonian. 1971 Red Man's Land/White Man's Law: A Study of the Past and Present Status of the American Indian. New York: Charles Scribner's Sons. 1975a The Indian in America. New York: Harper and Row. 1975b The Assault on Indian Tribalism: The General Allotment Law (Dawes Act) of 1887. Philadelphia: Scribners. 1981 Omaha Tribal Myths and Trickster Tales. Chicago: Sage Books. 1974 Bright Eyes: The Story of Susette La Flesche, an Omaha Indian. New York: McGraw-Hill.